I don't know about you, but it's been a super busy week here for me! 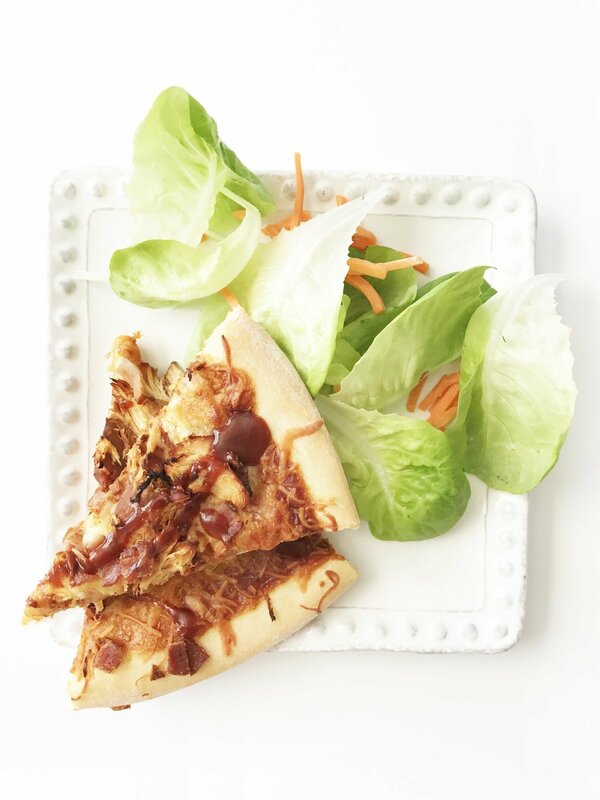 Somewhere between getting ready for my weekend trip out of town and my grandmother coming in, I managed to whip up this fabulous BBQ Chicken Pizza. Hey, a girls gotta eat too ya know! While I knew that this pizza was going to be delish, I didn't think it would be quite as amazing as it ended up being. 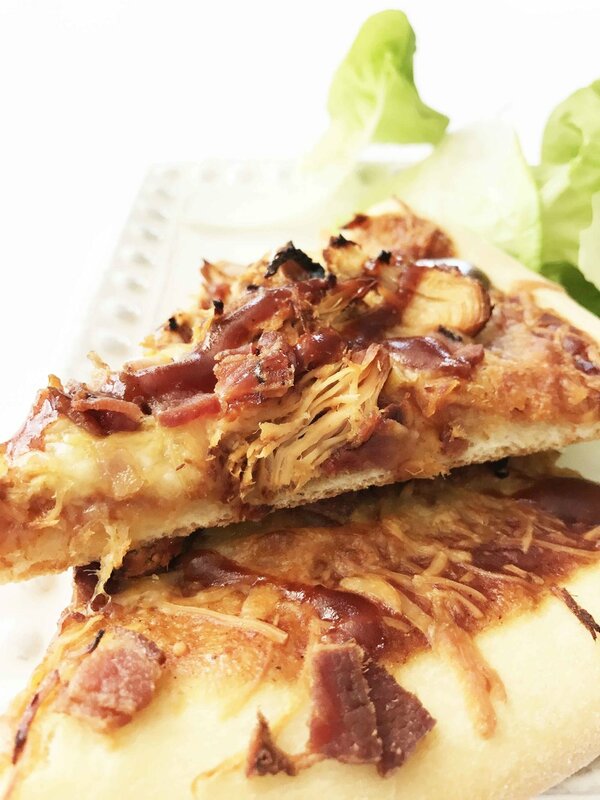 Basically this BBQ pizza is a great way to use up any leftover chicken that you might have. I happened to have some on hand from a night or two before and instantly knew what I wanted to do with it. Shred it, toss in some BBQ sauce and let the fun begin! As if that wasn't enough I started this pizza out with a frozen wheat crust that I was able to thaw and then roll out into my appropriate pizza crust. Instead of the usual 'pizza' sauce, I used a BBQ sauce. For me, I always prefer a 'smoky' BBQ sauce. 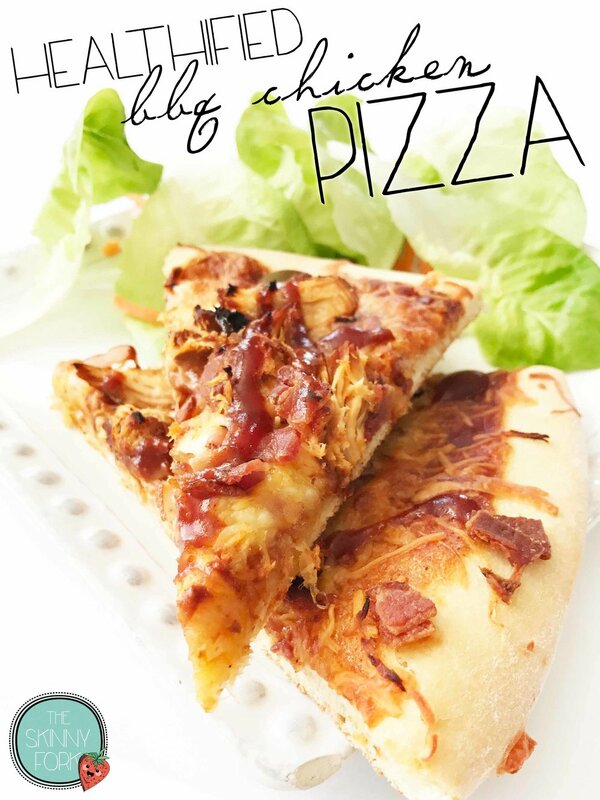 I then layered the sauce with some reduced fat pizza blend cheese, my shredded BBQ chicken, and of course a few bits of bacon crumbles. If it had just been me, I probably would have added some red onion in on there too. 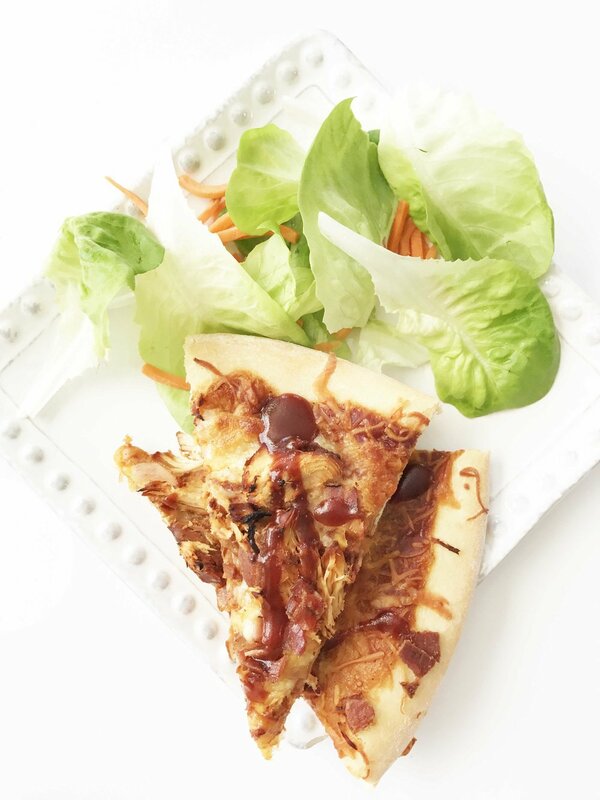 I gave one final drizzle of BBQ sauce over the top of the cooked pizza and called it a day. 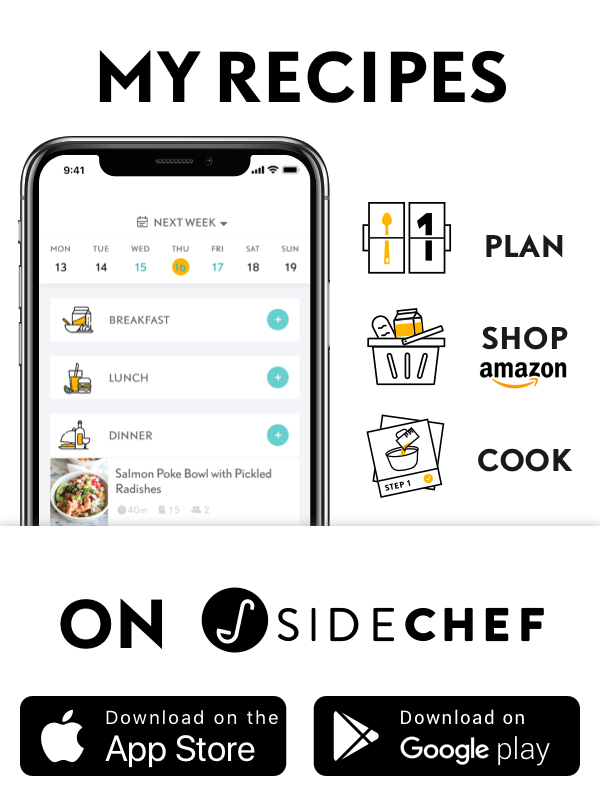 This turned out leaps and bounds better than what you might order out. It was full of flavor, hot, fresh, and exactly the way I wanted it with the ingredients I know and love. I served my pizza along side a light leafy green and some shredded carrots since I'm pretty sure that I used up all of my creative bits for the day on the pizza instead. Hey it can't ALL be fancy. In all honesty, there is little that I would do differently the next time that I make it (aside from the little bit of red onion.) It was an amazing pizza that got rave reviews from around the table. Definitely a perfect way to get through the busy week! Preheat the oven to 375 degrees F. and lightly spray a pizza pan with non-stick cooking spray. Roll your dough out and place it onto the prepared pizza pan. Top the dough with the 1/4 C. BBQ sauce and spread it out. Sprinkle the 1/2 C. cheese over the sauce. Once done and the edges are starting to turn golden brown, remove the pizza from the oven and drizzle with a little more BBQ sauce if desired. Cut into 8 slices.